The Institute for Historical Justice and Reconciliation commits itself to promoting reconciliation, tolerance and understanding in historically divided communities. It looks at unresolved historical claims, which can, when misunderstood or manipulated, create and reaffirm prejudice and hatred among populations, thus fuelling ethnic and nationalistic violence and conflict. It has brought together historians from various communities to research and write about conflicting narratives of the past. 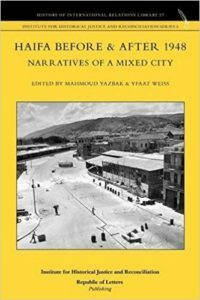 Haifa Before & After 1948 – Narratives of a Mixed City edited by Mahmoud Yazbak and Yfaat Weiss is a good example of their work. 14 scholars and experts from Jewish as well as Arabic decent have looked through various articles at the history of Haifa before and after the 1948 from cultural, political and social angles. The war of 1948, which changed the demographic picture of the city, as it lost almost its total Arabic population, is not directly addressed, but in each individual article the impact of the dramatic events is visible. The publication shows how by researching the past through a micro lens of city history, the reader is made to understand how big history of modernisation, industrialisation, persecution, colonization and war influenced the lives of each individual citizens in Haifa. The books tells stories about the vast growth of the city in the early Twentieth Century, the life during the British Mandate period, the inter-ethnic competition in the oil and soap industries, the Arab-Jewish inter-communal relations and gender interactions in the Twenties and the Thirties. The articles in Haifa Before & After 1948 are of various quality and a more rigorous editing would have certainly have supported a bit more consistent publication. The downside of writing such micro history is the absence of a bigger context. These stories lack a comparative attitude, which inevitably leads to an emphasis on uniqueness, which had been probable less if it had been embedded in a bigger question. Despite these imperfections the book is very much worthwhile reading. One article stands absolutely out and addresses fully what the Institute for Historical Justice and Reconciliation stands for. “Eraser” and “Anti-Eraser” – Commemoration and Marginalization on the Main Street of the German Colony: The Haifa City Museum and Café Fattush written by Salman Natour and Avner Giladi gives a deep insight in the highly politicized memory policy related to the city’s historical narrative as presented in street (re)naming and by the Haifa City Museum. This museum is housed in the Community Building of the German Colony. The German Colony was the first of seven 19th century colonises of the Templars, a branch of the German Evangelical Church. The way the history of this community is interwoven into the narrative of the Museum is fascinating. The way Haifa’s history is presented, (mis)using and leaving out elements of its Arabic, Jewish and German history, is really mind boggling. This article should be compulsory for each student or colleague who is interested in the politics of memory.